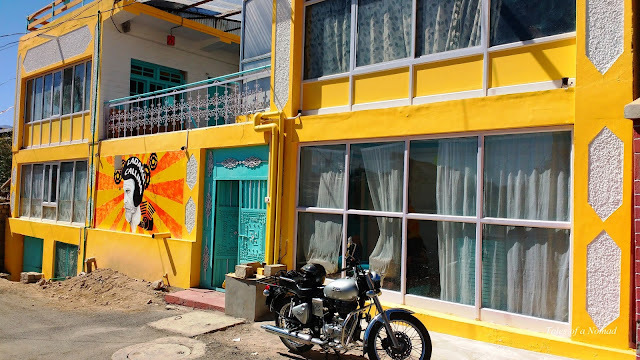 Away from the vibrant markets of Leh, Hostelavie is located just a kilometer before the town while travelling on Manali- Leh road. 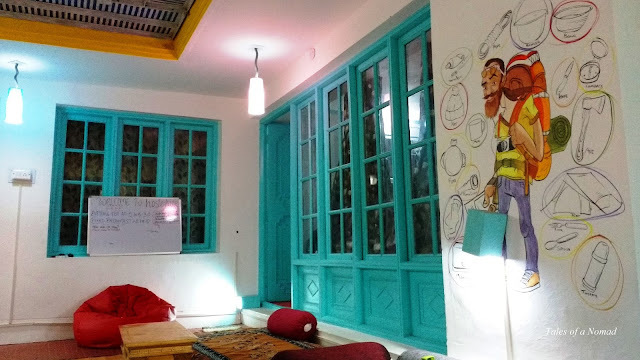 The colourful outdoors and the pleasant interiors make the hostel a cosy one. 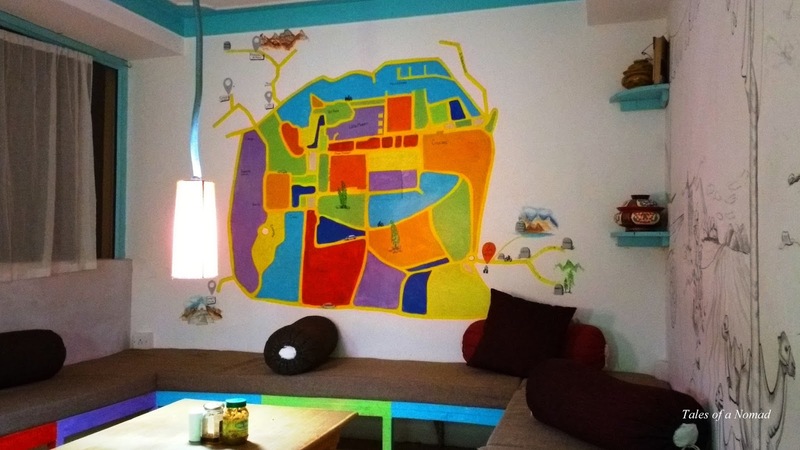 The walls in common area and the dining space are adorned with art work and maps of Leh. Apart from 3 bed, 10 bed and 12 bed dormitories, Hostelavie also offers one standard room and one deluxe room. 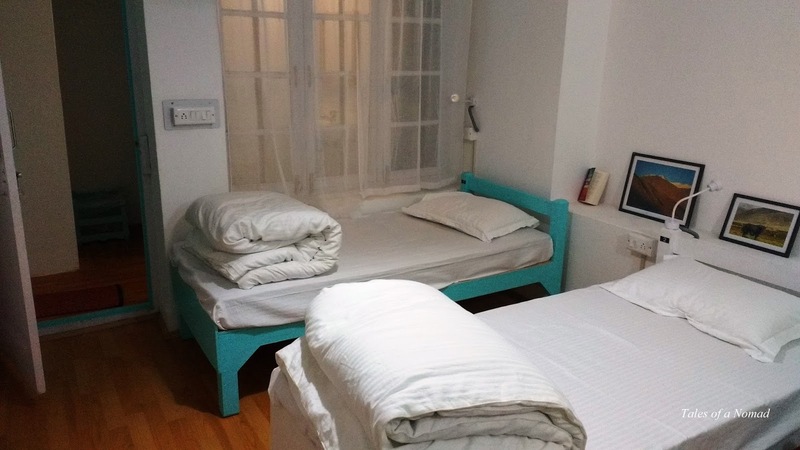 The hostel became functional this year in June and remains closed during the winter months until April. Tariff: Starting from INR 299 per night, the tariff is one big highlight Hostelavie has over other hostels and guest houses. Breakfast: Complimentary breakfast makes the tariff look all the more attractive. Though they do not have wide options, the menu changes almost every day. Staff: Phunchok and her team are quite friendly and help you in planning short trips near Leh. Rooms: The dormitories are simple and kept tidy. Wifi: There is no Wifi at the hostel. Though many of us would like to disconnect from internet and social media while travelling, it could be a concern when you need to access an urgent mail. Data services are pretty weak in Leh, and that makes wifi all the more necessary. Leh-Manali highway, Leh Ladakh, 194101. P.S. : This is not a sponsored post. Cool artwork on the walls.